The JioPhone, rolling out this week for a refundable deposit of 1,500 rupees ($23.05), will cost at least 2,500 rupees ($39) to assemble. Reliance Industries’ telecom upstart Jio is footing at least 40 percent of the cost of its basic 4G phone, two sources familiar with the matter said, as it bets on recovering the investment by luring in millions of new customers. 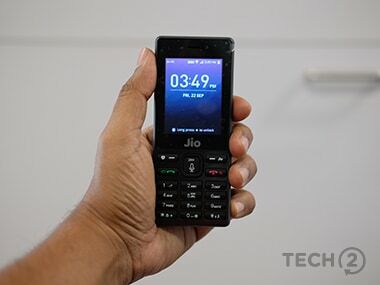 The JioPhone, rolling out this week for a refundable deposit of 1,500 rupees ($23.05), will cost at least 2,500 rupees ($39) to assemble, the sources told Reuters. That means Jio will likely carry more than $150 million in costs for every 10 million JioPhones it sells. And the company aims to build a subscriber base of between 250 million and 300 million users in the next two years, said one of the sources. Reliance Industries did not respond to a request for comment. Some Reliance investors may flinch at the cost of subsidies, but the scale of the outlay is a clear signal of the level of Jio’s ambition, as it targets an audience of some 500 million who still cannot afford smartphones in India. Jio’s advanced voice over LTE (VoLTE) network only works with 4G enabled devices, inaccessible to many even at subsidised rates. The significantly cheaper JioPhone, however, will open the Internet to a less affluent segment of Indians for the very first time. Analysts estimate a majority of Indian feature phone users have an average revenue per user (ARPU) of rupees 50 or lower. JioPhone’s 153 rupees monthly plan for so-called pre-paid users aims to drive up this ARPU, the first source said. Jio, backed by India’s richest man Mukesh Ambani, has amassed more than 128 million subscribers since its launch last year, by offering free voice and cut-price data for months. Over half a dozen wireless carriers compete for market share in major Indian cities, but Reliance, the first source said, sees the telecom market being winnowed down into a three player market with just Jio and current leader Bharti Airtel and the Vodafone-Idea combine likely left standing. The JioPhone is currently being manufactured in China, based on a unit reviewed by Reuters, but Reliance is likely to tap the likes of Foxconn and Flextronics, which have facilities in India - to assemble it in the country, a Reliance executive told Reuters previously. The phone’s chipset, being supplied by Qualcomm and China’s Spreadtrum, is likely to be its most expensive component while batteries are likely to cost $3-$4, the first source said.